While the nation gazes at the Japanese crested ibises on Sado Island, I prefer to fix my eyes on the falcons of Mt. Yagigahana. Located in the Shitada area of Sanjo City, the birds are designated as one of Niigata Prefecture’s protected species. According to a story in May 31 edition of the Niigata Nippo Newspaper, a breeding pair of falcons, who have inhabited the area for years, once again hatched eggs this year. 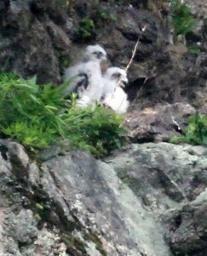 Two young birds have been spotted in the nest on the cliff, but they are not yet fledglings. In Japan, their nesting location was believed to be along the rocky stretches by the sea, but recent reports indicated that falcons choose to nest on high-rise buildings and iron towers. One such nest has been found on the Niigata Prefectural Government Building. Still, it is not so usual that falcons inhabit mountainous areas. When I was very small, falcons actually inhabited the area around my family’s house. In fact, the birds were so famous that many clubs and buildings were named after the “hayabusa.” However, they vanished from there soon after and were gone for a very long time, though there are some who say the birds never really left and were just hidden from view. Regardless, some twenty years ago, they made a comeback and can be seen in plain sight once again. I wish that the two young birds will soon be able to leave their nest safely.